British Rally Championship contender Matt Cotton took the silverware back to Cornwall last weekend, when he contested the season opener, Rallye Sunseeker. Cotton from Cornwall and co-driver Glyn Thomas from Somerset, finished a creditable 12th overall and 2nd in class against a strong international field which assembled in Bournemouth to compete over 65 hard fought stage miles. The championship is one of the most highly regarded in the world and due to the new 2 wheel drive only format, has attracted entries from esteemed manufacturers such as Ford, Renault and Citroen. Driving a Ford Fiesta ST in the AVS Motorsport team and returning to international competition for the first time in 4 years, the South West pairing had a tall order ahead of them when the event started with an autograph session in Poole Harbour on Friday night. The pair had only ever competed together once before and Matt had the added challenge of driving a left hand drive rally car for the first time. 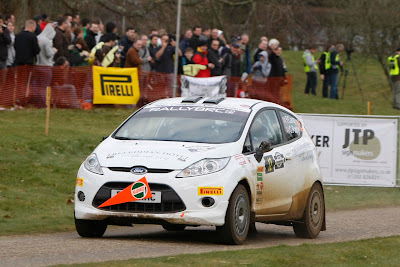 But the apprehension before the event was soon to disappear as they started the first special stage in the New Forest. The first loop of stages took crews to the sandy forests of Wareham where they set some competitive stages times despite a few moments on the first stage; “I really needed to settle into a good rhythm in the first few stages to build my confidence to be able to go on the attack in the afternoon” said Matt. “But we had a big scare on the very first stage when we hit a large section of standing water at high speed which forced us into the greenery at about 70mph”. Remaining focused through the rest of the day would become key to a good result and as the day progressed, so did their pace; “The Fiesta is a great car and I still have a lot to learn about how it performs” said Matt at the last service of the day. “I’m really pleased we are getting quicker as every stage passes and we have managed to set several fastest stage times today. It’s encouraging that we can come back to the championship after a long break, and still be on the pace of the more experienced drivers”. Matt Cotton at the wheel of his Fiesta. As dusk fell on Bournemouth pier the remaining competitors and cars gathered to large crowds along the seafront, to spray champagne at the ceremonial finish celebrations. As a testament to the tough conditions on the stages only half of the original entries managed to make it through the day. But the team drove over the finish ramp to celebrate a fantastic result for their first rally of 2012. “It’s a great start to the season and this result it better than we could of hoped for” said Glyn at the finish. “We had a lot to overcome today and our pace improved every stage we did. We are really looking forward to the next round of the championship in March where we can really start to push”. 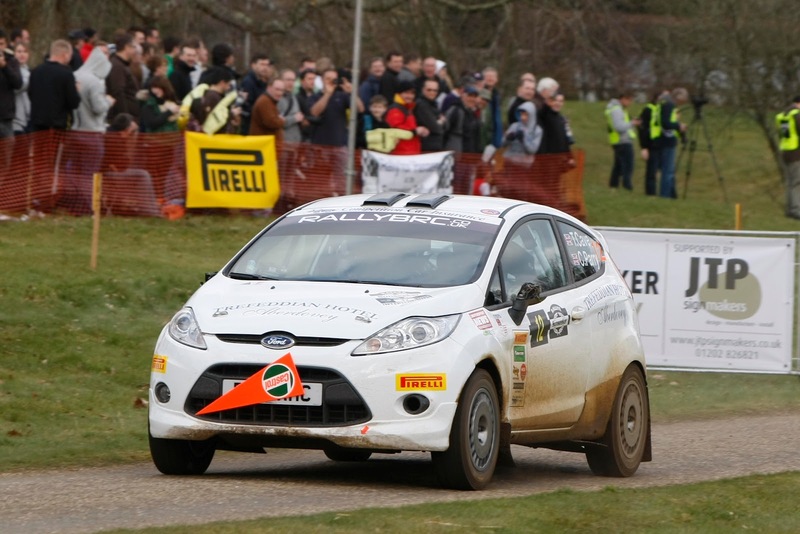 Matt lies in 12th place in the British Rally Championship, 2nd in class 8 and 7th in the Fiesta Sport Trophy. Matt also helped AVS Motorsport to 3rd place in the team’s championship standings. Welsh rally driver Tom Cave left Bournemouth with a solid points haul to begin his 2012 British Rally Championship season this weekend. 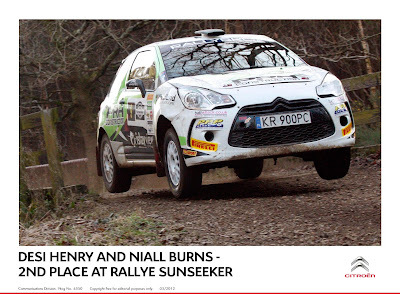 The youngster, second on last year's event and partnered by Craig Parry, completed the 12-stage Rallye Sunseeker in 7th place overall after a gritty performance in a rented car. It was a tricky day for Tom; while the weather was sunny and bright, he was driving the rented Ford Fiesta R2 for the first time, having completed just 20Km at the wheel at the event shakedown prior to the ceremonial start in Poole on Friday evening. As tradition dictates, the start ceremony was incredibly well attended by fans and set the scene for another thrilling first round, with the BRC this year adopting 2WD cars only. Tom and Craig began the day conservatively, keenly aware that they needed a solid points finish to begin their season. As they tackled the first loop of stages, their pace gradually improved and included a fourth-fastest stage time, arriving at the first of the event's three services in 10th place overall. Several changes to the Fiesta's settings helped the car's performance but an overshoot on the next loop dropped the crew to 11th overall by the mid-point of the event. By Tom's admission, the Fiesta performed better on the faster sections of the event than the slower and tighter ones and by the final loop of three stages, he and Craig were in a position to exploit mistakes made by other drivers. By the time the crews reached the finish ramp in Bournemouth, they had climbed to 7th place overall and third Fiesta. Commenting, Tom said; "I'm pretty happy with the result - we got a decent points haul for the first round and that's what we were looking for. We decided to drive our own rally and see where we were on pace and towards the end, found ourselves in a bit of a scrap with Matthew Cathcart, which was good fun. "I think we adapted to the Fiesta reasonable well. It's a good, solid car but it doesn't seem to have the legs that the R3 cars do, such as the Citroen DS3, as we'll be using for the rest of this season. It was pretty good on the faster, more open stages but of course, struggled a lot compared to the 4WD cars I'm used to in the slower corners. It's been a while since I've driven 2WD! "We made some changes to the car's set-up early on but I think that this didn't really help us and the overshoot cost us some time, which on this rally, is very difficult to make back up again. But we managed to get up to 7th and some decent points for that, so overall, I'm fairly happy." There's little chance for rest for Tom though, as next weekend (2-4 March) he will be tackling the second round of the BTRDA series in his Subaru Impreza, one of the cars he used to clinch the 2011 Production Cup title. However, for this year, the car has been converted to closer to B13 specification, allowing Tom to challenge for the outright Gold Star title, rather than the Production Cup. He, Craig and the Davies MotorSport Services team will travel north to Cumbria for the Malcolm Wilson stages rally on Saturday 3 March, before returning to Wales as soon as that event finishes, ready to compete on the Mid Wales Stages on Sunday 4 March. Tom and Craig won the Mid Wales Stages outright in 2011 and will be keen to defend that win next weekend. He then plans to debut the Citroen DS3 R3T he has secured for the BRC at the second round, the Bulldog Rally in Welshpool at the end of March. 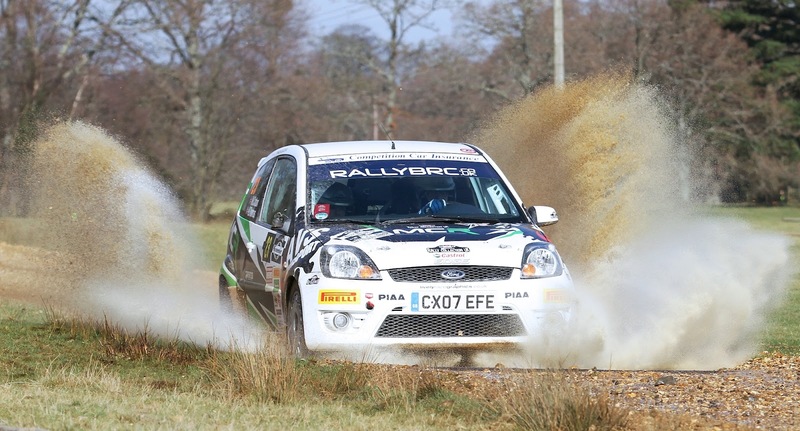 Stourbridge rally driver Richard Sykes made a brilliant start to his 2012 rally season when he took second place overall in the Rallye Sunseeker Challenge event, the opening round of the BRC Challenge championship. 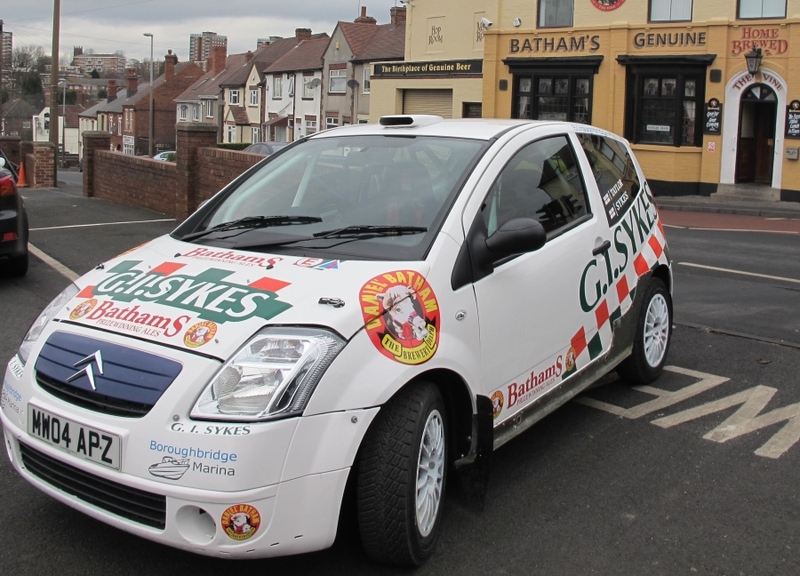 Driving his Bathams Brewery, G I Sykes Ltd, Boroughbridge Marina and Silverstone Tyres-backed Citroën C2 R2 Max Sykes and co-driver Simon Taylor were immediately on the pace with second quickest time on the opening Gore Heath test. Their pace continued through the days ten stages, consistently setting top three times before finishing the event with a stunning fastest time in the final Uddens stage. "I had a really good weekend, the car never missed a beat, it was the best it’s ever been," said Sykes. "All the hard work that we’ve done making the car fast and reliable seems to be paying off." "I knew that competition would be tough at the top of the leaderboard so I was flat out right from the start. I’m delighted that we set top three times pretty much all of the event and it was fantastic to end the event with a fastest time, that really sets us up for the next round." "I drove my heart out and didn’t back off all day so I’m pleased to have got a good result to get our season off to a cracking start." "It was a brilliant event, the organisers put on a great show with the ceremonial start in Poole town centre, it was good to see so many people down there to watch the cars." Sykes will next be in action on round two of the BRC Challenge which will take place at the Bulldog Challenge rally in mid-Wales on March 24th. The young Scot had a challenging first event in the brand new car, deciding from the outset not to try and stay with the expected pace of double British Rally Champion Keith Cronin, who was driving an identical specification car. Their steep learning curve on this, Garry’s first MSA British Rally Championship event, was further complicated by a car that had been finished just a day before the rally shakedown on Thursday. But the loose surface revealed a rock, which added a bent steering arm to his learning experience. After a great job by his team, ably assisted by Monster Sport Europe, the Twingo Trophy parts and technical partners, he went out again and made the finish ramp in Bournemouth to take the champagne and maximum points in the Twingo Renaultsport R1 Trophy UK. Their prize of a £750 parts voucher is added to a maximum haul of MSA British Junior Rally Championship points towards their hope to take the Rallye du Var prize drive at the end of the year. Although not scoring Twingo Trophy points, Cronin and Seb Marshall were indeed the pace-setters in their R1 Mantis-liveried car, even topping newcomers Chris Ingram/Joe Cruttenden and Nick Allen/Andy Bull in their R2 machines on the first loop of three stages. Sadly Cronin and Marshall’s puncture and subsequent driveshaft failure sidelined the Irishman on stage ten of twelve, but their performance had put the pocket rocket midfield throughout the day, leading the class and proving that at just 133 horsepower, the entry-level Twingo can be a force to be reckoned with. Despite the Twingo R2 Trophy kicking off on the Bulldog Rally North Wales in March, Ingram and Allen had opted to contest Rallye Sunseeker, adding some spice to the Renault contingent on the event. 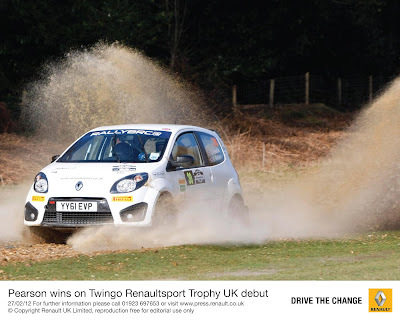 It was 2011 Junior 1000 Rally Champion Ingram who was fastest Twingo on stage four, but the Cheshire lad had some bad luck on the very next test, becoming one of several crews throughout the field to retire with transmission problems on the slippery surface. It was therefore the furthest travelled driver who was top R2 Twingo at the Bournemouth finish, Californian Nick Allen ably guided to an excellent twelfth place overall by Birmingham’s Andy Bull. He and R1 Trophy winner Pearson were delighted at the finish; both commenting on how well the Dorset and Hampshire based event was run. Also pleased with the event and taking part as part of the official event team were Justin Dale and Andrew Bargery. They ran Renault Sport Technologies brand new Twingo R2 Evolution as a course opening car, ensuring that the stages were correctly set up, marshalled and that spectators were aware of the impending international rally. 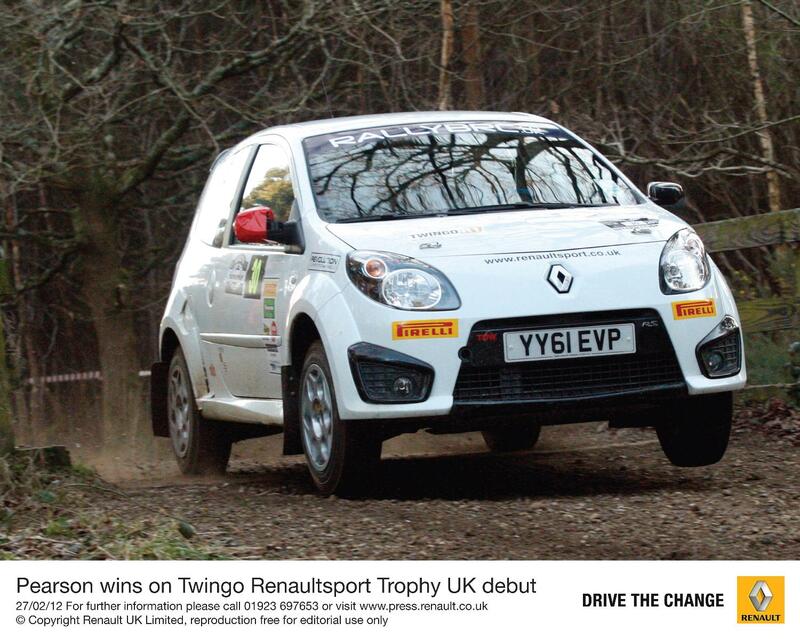 The world public debut of the Twingo R2 Evolution was a great success, the car running faultlessly. Despite not appearing on the results of the event, three times event winning co-driver Bargery was able to feed back some competitive unofficial times to the French team for technical data. The next round of the MSA British Rally Championship, Bulldog International Rally North Wales, will host both the Twingo Renaultsport R1 and R2 Trophies. 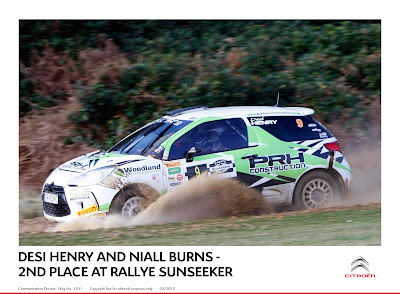 Coverage of the series from Rallye Sunseeker will be part of the Sky Sports British Rallyzone programme, broadcast during the week preceding the classic March 23/24th Welsh rally. 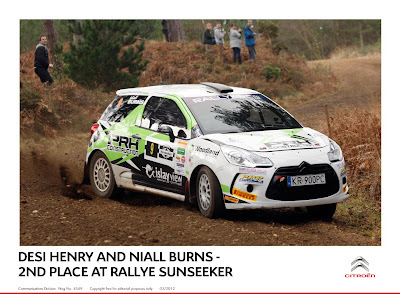 The Bournemouth based Rallye Sunseeker, round one of the MSA British Rally Championship presented the first chance for the Citroën runners to demonstrate their DS3 R3’s, and challenge for overall championship honours. They didn’t disappoint! Desi Henry and Niall Burns brought their DS3 home in second overall after a late charge and Oisan Pryce with co-driver Iestyn Williams claimed a fine fourth place. After this first round, Citroën UK are second in the Manufacturer’s Championship, just one point adrift of Renault. It could have been even better for Citroen as fast Finn Jarkko Nikara struck trouble on the penultimate stage. It all helps put Citroën UK into second place in the Manufacturer’s table with the next round of the MSA British Rally Championship, the Bulldog Rally on the 23rd and 24th March. I suspect that this Cobra is flagrantly disregarding the posted speed limit! The Cholmondeley Pageant of Power (15 to 17 June; www.cpop.co.uk), the UK’s biggest celebration of power and speed, will this year mark the AC Cobra’s 50th anniversary with a major vehicle display and thrilling, high-speed action on the venue’s circuit. The Pageant will host the largest gathering of the Anglo-American sports car in the UK this year in a special display entitled ‘Cobras at the Castle’. 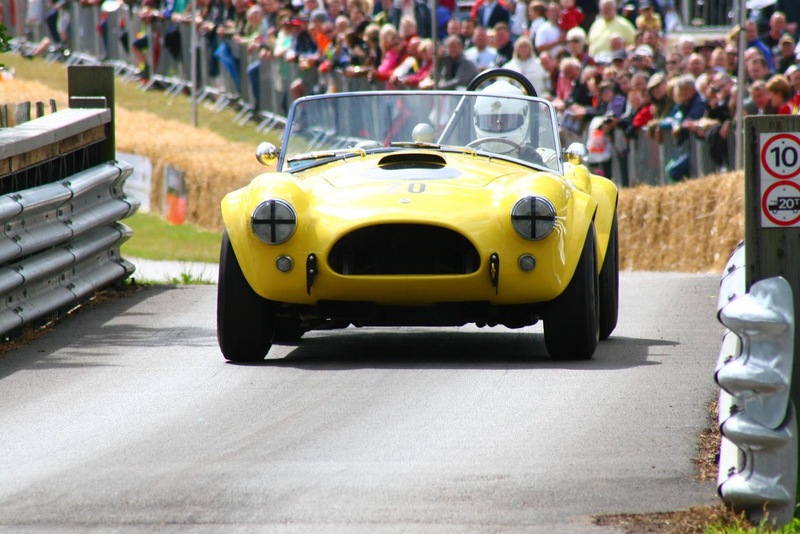 The event is also introducing a special race category – the ‘AC Cobra 50th Anniversary Class’ – that will see the most famous Cobras, including one of only three ‘Lightweight Cobras’ ever built, compete for top honours. You definately don't see many Daytona Coupés around! When introduced in 1962, the Mark I AC Cobra featured a 4.2-litre V8 engine from Ford Motor Company, upgraded to a 4.7-litre unit in 1963 for the Mark II. Race-derived versions of the Cobra were dominant on the domestic US and international racing calendars. The fearsome AC Shelby Cobra Daytona Coupé won the 12 Hours of Sebring GT class twice in 1964 and 1965, finished fourth overall in the 1964 24 Hours of Le Mans, winning the GT class, and recording victories across a number of other endurance events – often ahead of its main competitor, the Ferrari 250 GTO. 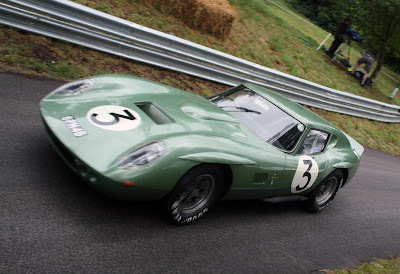 The car also won the 1965 International Championship for GT Manufacturers in the World Sportscar Championship, winning 8 out of 10 races. In the face of rising competition from other manufacturers, particularly GM’s Grand Sport Corvette, the Mark III Cobra (427) was introduced in 1965 with a 420bhp 7.0-litre V8 engine, becoming the most powerful production car in the world at the time. The Rally2Raise charity fund and awareness raising team enjoyed a very successful Snowman rally last weekend when they debuted their Nissan Micra rally car and collected a generous amount of money for their four causes. The Highland Car Club-organised event was the opening round of the Scottish Rally Championship and the club agreed to let Rally2Raise project founder Rachel Medich drive as course car on one of the rally stages. Rachel, from near Aberdeen, is usually found in the co-driver’s seat and the Snowman was her first experience of driving a rally car in the forest. Despite the forest track being extremely slippery Rachel and co-driver Marieanne Gray kept the car on the road and made three good runs of the stage. 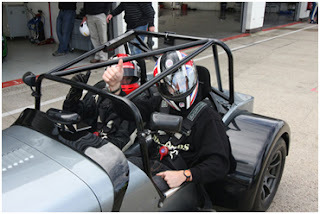 "I loved every second of the driving practice I got, it was great fun," said Rachel. "A huge thank you to Highland Car Club and all the marshals, officials, rescue, doctors, recovery and radio crews for allowing us to get out and raise vital funds and awareness for our causes." "A big thank you to Marieanne also for keeping me right on the stage, we had one moment where we nearly left the road as it was extremely slippy but fortunately we did not crash." 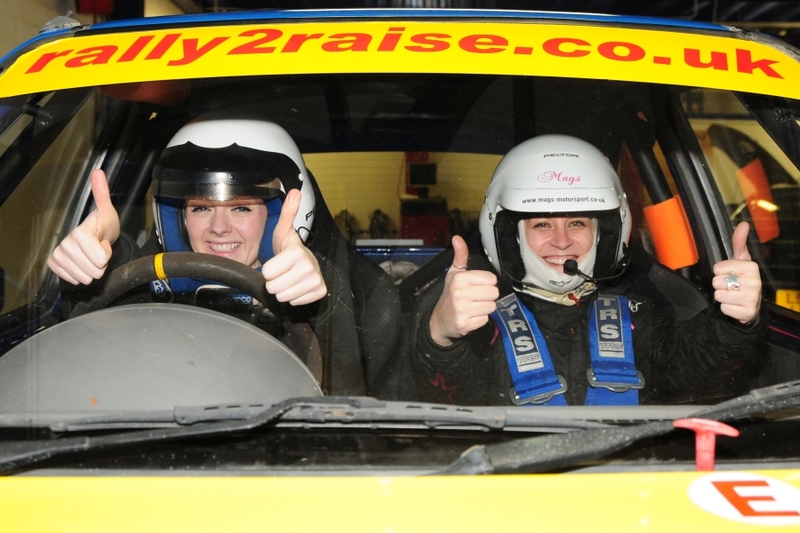 As well as driving the stage Rachel and Marieanne had a bucket collection at the event which raised £191.99 for the four Rally2Raise causes: the Nystagmus Network, Cancer Research UK, the MS Society and the Joanne Bingley Memorial Foundation. "The people at the rally were very generous, I’m delighted to have raised so much with our buckets, thank you very much to everyone who contributed." The team will next be out on the Saltire Classic Rally on March 4th. They will be running the Micra ahead of a field of classic cars on a route which takes in some beautiful countryside around Pitlochry. Please visit www.rally2raise.co.uk or www.facebook.com/rally2raise for more information on the project. Donations can be made online via uk.virginmoneygiving.com/rally2raise. 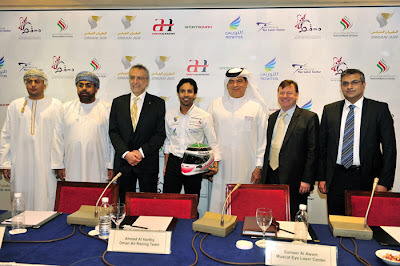 Ahmad Al Harthy and the Oman Air Racing Team have confirmed a return to UK racetracks for the 2012 motorsport season after announcing a third successive season of participation in the Porsche Carrera Cup GB. Revealed at an official press conference held at the Muscat Intercontinental Hotel in Oman this morning (21 February), the 30-year-old racing driver detailed a continuation of Oman Air as title sponsor for 2012 as part of a truly prestigious and wide-ranging commercial portfolio. Ahmad will return to compete in the Pro-Am 1 Class of the UK’s premier one-make sportscar championship this year, having finished the 2011 season a fantastic third overall in the standings with 12 podiums from 19 races – including two Pro-Am 1 wins. As for the past two seasons, the Oman Air Racing Team car will be prepared and maintained by Redline Racing. Since the conclusion of last year’s Carrera Cup GB campaign, the Muscat sportsman has continued to compete with selected outings in the burgeoning Porsche GT3 Cup Challenge Middle East series. From six races contested, Ahmad chalked-up a tally of three podiums with the highlight being a superb lights-to-flag victory during the FIA Formula One World Championship support race at Yas Marina in Abu Dhabi last November. He also won on his debut in the NGK UAE GT Championship at Dubai Autodrome, partnering double Carrera Cup GB champion James Sutton. “It’s incredible we’re returning to Carrera Cup GB”, said Al Harthy. “It’s one of the best motor racing championships in the world and it’s a huge honour to continue promoting Oman, and everything the country has to offer, through my racing on such a prestigious stage. I’m delighted too, of course, to have the continued support of so many incredible sponsors – it’s amazing. The GT3 Cup Challenge GB was launched at the Autosport International show back in January. Here is Porsche's own video explaining about the new series. The official launch of Mission Motorsport, an exciting new venture designed to provide amazing and unusual rehabilitation opportunities to service personnel affected by military operations will take place at Thruxton Circuit at 11am on Thursday 1st March 2012. Formed by a dedicated group of serving soldiers, officers and Motorsport professionals; Mission Motorsport’s mission is to use the competitive and dynamic nature of motorsport to inspire and rebuild confidence, develop skills and ensure that soldiers who are learning to cope with a disability gain a greater degree of independence through working in different and testing environments. Following a very successful year in 2011 establishing the principle, Mission Motorsport has been officially appointed as the British Army's provider of adaptive motorsport. The new organisation will work with the Defence Recovery Capability, Help for Heroes, Battleback and the veterans of the Band of Brothers to deliver stimulating, constructive and competitive activities ranging from high level racing to educational programs and vocational opportunities in partnership with the UK’s automotive industry. Full details of Mission Motorsport’s plans for 2012 will be unveiled at the launch however highlights are expected to include participation in the Britcar 24hr race, an offshore powerboat racing team and work placements with Bentley Motors. Servicemen who have raced and worked with Mission Motorsport in 2011 will be on hand and on the track to talk about their experiences and explain how being involved with Mission Motorsport has helped their personal recovery. The organisation is also expected to be able to announce the granting of charitable status. 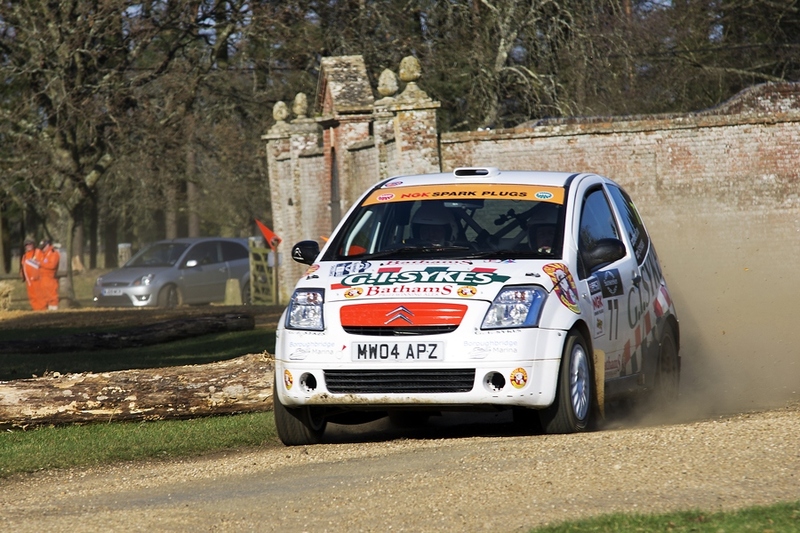 Citroën is pleased to announce that it will be supporting the MSA British Rally Championship as an official manufacturer for the 2012 season. With updated rules for the upcoming season - which specify two-wheel-drive machines - more emphasis is placed on driver skill, increasing the opportunity for Citroën to find the next Sébastien Loeb of the future and also develop its growing young driver programme in the UK. A number of privateers will drive a Citroën DS3 R3, the 210bhp customer rally car developed by Citroën Racing in the 2012 MSA British Rally Championship. With the new rules, Citroën will be eligible to earn points scored by privateer teams in the manufacturers’ championship. The MSA British Rally Championship remains the largest and most prestigious national rally championship, comprising six individual rounds across the UK. It was originally run in 1958 and earned a license from the Motor Sports Association (MSA) in 1999. BRC Manager Mark Taylor commented: ‘It’s great that Citroën, with such a strong rallying pedigree, has joined the Championship, and we look forward to working more closely with them going forward. The Citroën attack for this weekend’s opening round - Rallye Sunseeker International - is a strong one. Three young guns, Osian Pryce from Wales, Desi Henry of Northern Ireland, and the number one seed, fast Finn Jarkko Nikara will line up on Saturday in Bournemouth with their striking new privately run Citroën DS3 R3’s. Nikara, the 25 year old from Saarijarvi in Finland has an impressive C.V. to date, as he switches to the 210bhp Citroën DS3. 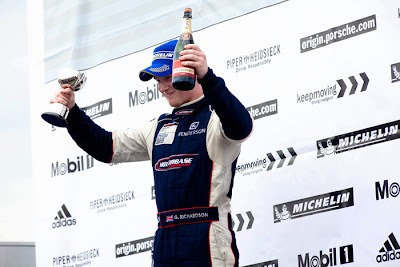 The former Finnish Junior Champion, and 2008 Pirelli European Star Shoot-out champion, has shone in the British Championship before, finishing sixth in the 2010 series using an R2 specification Renault. He has also been an extremely fast Group N driver at IRC and WRC level, and now relishes the chance to drive an R3 machine. “It’s fantastic to be returning to the BRC with Autosport Technology and to be driving the Citroën DS3 R3T – I know this is a very good car and I’m sure we can be setting fastest stage times. We won’t have time to test the car before this event, but the plan is to find a pace we’re happy with.” Jarkko’s first opportunity to drive the car will be in the event shakedown. The youngest of the Citroën runners is Osian Pryce from Wales, who will actually celebrate his 19th birthday on the eve of the rally! Seeded at number 10, Osian started his rallying career in 2008, competing in the Latvian Rally Championship from the tender age of 16. On his WRC debut on the 2010 Wales Rally GB, he took class honors by a staggering 22 minutes, before becoming the 2011 Fiesta Sport Trophy Champion. Now, however, he has switched to Citroën for 2012. Osian is happy after a test in the new car. “It’s a big step from last year’s R2 machine, but I could tell as a driver that Citroën Racing have put a lot of work into the car. We probably did 80 kilometers or thereabouts at Sweet Lamb and I really felt at home with DS3. It seems in some ways effortless to drive, and suits a smooth, tidy style. I am really looking forward to the Sunseeker and the BRC in the car. Our plan for the event however is to get a decent finish, as really it will be the first time we have measured ourselves against this line up of drivers.” Co-driver for the Welsh youngster is Iestyn Williams, whilst the car will be run by Andy Davies of Davies Motorsport. Another young Welsh driver, Tom Cave has also taken delivery of a DS3, but he expects to debut it on round two of the British series, the Bulldog. With the possibility of another DS3 for that round and the fact a Trophy for the DS3’s will start on the Bulldog rally with generous prize money, things are looking good for the Citroën drivers in 2012. It all kicks off with the Rallye Sunseeker ceremonial start, at Poole Quay in Bournemouth where an expected 10,000 plus crowd will turn out to wave in a new era of the MSA British Rally Championship. Then twelve loose surface special stages on Saturday will decide the winners as Jarkko Nikara leads the field into the forests. Renault debut new Twingo R2 Evolution. The car, which is the latest variant of the successful 1.6-litre Twingo, will act as a course car ahead of the main international field and will be run by Renault Sport Technologies’ own engineers. The Twingo R2 in its existing form has already tasted success on Rallye Sunseeker International, a pair of Autosport Technology cars taking the top two podium steps in Formula 2 in 2011, the ultra reliable multinational team going on to take the British Teams Rally Championship at the end of last season. Dale has already complimented the Twingo, having driven Pajunen’s car at a sponsor’s day last year and the R1 variant at this year’s BRC Media Day. He and Bargery will team up after last contesting the BRC in a Clio in 2006 to showcase the new Twingo R2 Evo, which will make its UK debut on the Dorset & Hampshire based event. Renault UK’s recent registration to this year’s British Manufacturers Rally Championship and the new Twingo Renaultsport Trophy coupled with around a third of the entries on this year’s opening round, underlines the French marque’s commitment to UK rallying. 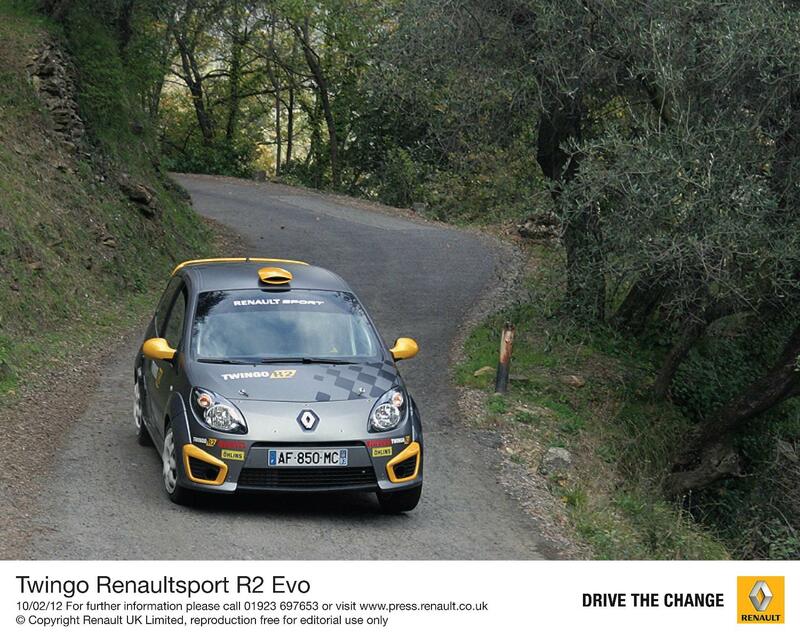 “We are keen to show off the new Evo version of the Twingo R2 and evaluate its performance on gravel. The British Rally Championship’s move to a two wheel drive formula is important to Renault and we intend to be at the forefront with our range of cars,” said Renault Sport Technologies Sales Manager Jean-Pascal Jocou, who will attend the event to keep an eye on not only Dale’s progress, but all the Renault competitors. Reigning Protyre Formula Renault BARC Champion Dino Zamparelli did his bit to help inspire the next generation of racing drivers and engineers recently, delivering a motivational talk and presentation to more than 250 pupils at Ashlawn School and Science College in Rugby. The Bristol 19-year-old, who made history last November as the first driver from Protyre Formula Renault BARC to become a finalist in the prestigious McLaren Autosport BRDC Award, attended the Warwickshire secondary school earlier this month. Invited along as part of a specially organised ‘Super Learning Day’ off-timetable event, Zamparelli, who is rightly regarded as one of Britain’s top young stars of the track, delivered an inspirational talk on the determination and resilience required to be successful in motorsport. 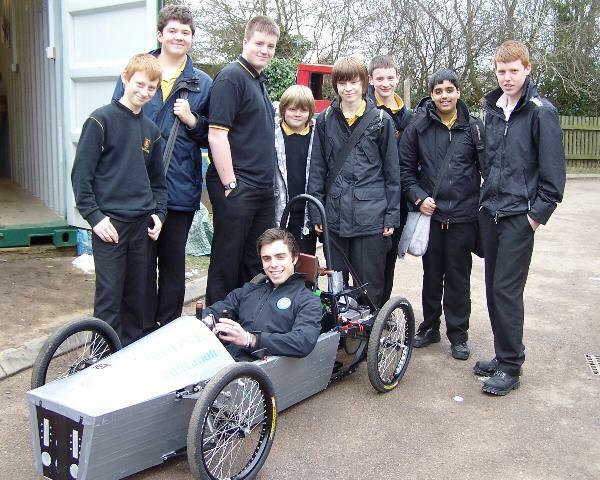 Following the talk in the main hall, the British Racing Drivers’ Club (BRDC) Rising Star met with the school’s own IET Formula 24 racing team – a group of pupils involved in the Greenpower Education Trust-led sustainable engineering project. Sharing tips and offering great encouragement, Zamparelli provided a major boost to the team which is busy preparing for the first F24 event of the season at Silverstone in Northamptonshire on Sunday, 29th April. The Super Learning Day was rounded off, unsurprisingly, with a very busy and popular autograph signing session. “It’s fantastic to see such enthusiastic young engineers who, I’m sure, will be the race engineers of the future”, said Zamparelli, “Meeting the F24 boys was great and I think it was good for them to meet someone who is involved in racing, it was nice seeing the car they’ve produced and it’s great for the engineering side of the sport that young people are so interested. The battle to succeed Zamparelli as Protyre Formula Renault BARC Champion will begin less than seven weeks from now when rounds one, two and three of the 2012 season take place at Snetterton in Norfolk on 7th/8th April. Zamparelli, meanwhile, is working hard to try and secure the budget to graduate to the FIA Formula 2 Championship this year. The Porsche Carrera Cup GB has continued its association with Sacred into a third consecutive season to provide teams, drivers and guests with gourmet coffee throughout the coming race season. Sacred will be the supplier of coffee in the Carrera Cup GB race centre, which is home to over 300 people on busy race weekends. Tubbs Wanigasekera and Matthew Clark formed Sacred in 2005. Now seven years and over two million great coffees later, Sacred now has six locations in Central London and a reputation for being one of London’s favourite café experiences. “Sacred is incredibly proud to support the Carrera Cup GB for another season,” said Wanigasekera. “The partnership is perfect for our brands and we are excited to be part of the Porsche family for another year. Entering our third year together is testament that the relationship with Porsche and our Sacred Coffee brand is successful and provides fantastic exposure to us and our core product of gourmet coffee." "Sacred would also like to congratulate James Sutton and Simon Leonard at Redline Racing for winning the 2011Carrera Cup title, and wish them and the other drivers the best for the 2012 season." George Richardson will join Parr Motorsport for an assault on the Pro-Am1 category of the Porsche Carrera Cup GB this season. Richardson, who will only celebrate his 21st birthday during the week following the final races of 2012, will go into his third season in the Carrera Cup GB aiming to be one of the pacesetters in the category. 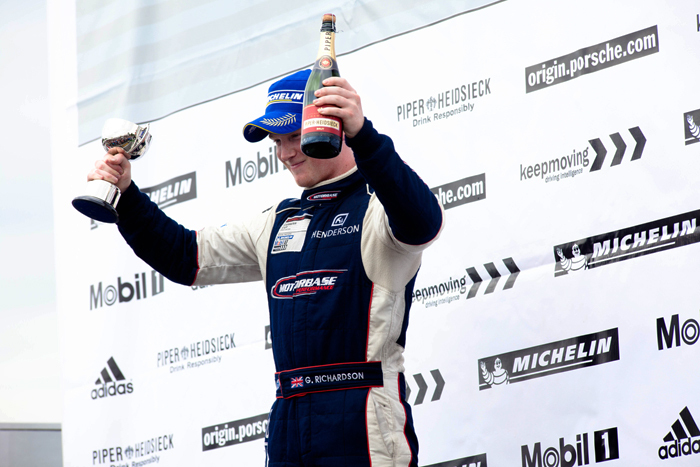 Manchester-based Richardson had his first full season in the Carrera Cup in 2010 and finished third in the Pro-Am2 category with four wins. In 2011 he was fifth in Pro-Am1 with six podiums, five of them in the final eight races of the season. For the coming year, Richardson will join Ben Barker (20) and Chris Dymond (24) to give the Sussex-based team an incredibly strong and youthful driver line-up. The overdrive TV page which holds our programmes is currently unavailable due to maintainance, it'll re-appear shortly. In the meantime, you can still watch our programmes on Youtube at www.youtube.com/overdrivemotorsport - Thanks for your support! This weekend will see Cornish rally driver Matt Cotton return to the British Rally Championship after a 3 year break from the sport when he lines up to tackle the Rallye Sunseeker which takes place in the Bournemouth region. Having to take a forced sabbatical from international rallying in 2009 due to a lack of funds, Matt will face some of Europe’s fastest drivers in the race to win the UK’s most prestigious rallying title. The British Rally Championship season opener kicks off with an autograph signing session and event start on Poole Harbour during Friday night. An early start Saturday morning will greet the crews before taking them through 65 hard fought miles of forests in Dorset & Hampshire, testing both car and competitors to the limit. If they survive the day, crews will spray the champagne with a ceremonial finish at Bournemouth Pier on Saturday evening. Matt will be co-driven this year by long time friend Glyn Thomas from North Somerset and they will contest both the British Rally Championship and Fiesta Sporting Trophy championships during 2012. “We are doing our best to raise funds for our BRC assault this year and I’m doing everything I can to make sure we can get a great result and find the sponsorship we require. We would like to welcome our technical partners, Rally Collection UK, Dogcam Sport, PIAA and First Class Technologies to the team”. During the event, Matt will have a dedicated media team on hand to keep you informed with LIVE news from the event as its happening. You will find results, news and images of Matt’s progress both on and off the stages by visiting www.mattcottonrallying.co.uk, following us on Twitter, or finding us on Facebook. Throughout the year, the team will embark on a fundraising campaign to raise money and awareness for Cancer Research UK. Both on and off events, the team will be asking fellow competitors, spectators and supporters to dig deep in their pockets for this worthy cause that is close to their hearts. “I lost my Father to cancer last year and it been a really tough time. I think we all know someone who has suffered from this terrible disease so we just want to give a little something back to this valuable cause. Glyn’s Mother suffered from breast cancer in 2006 but is now in remission, so Cancer Research UK was the obvious choice to support” said Matt. Organisers of the Protyre Formula Renault BARC Championship have reached agreement with its teams and the British Automobile Racing Club to establish a three-round ‘Renault GP Cup’, taking place as a stand-alone class in the final three events of the 2012 Certina Formula Renault 2.0 UK Championship to help bolster grids in the national-level category. With proposed competitor numbers for the cost-effective Formula Renault BARC series looking very strong for 2012, championship promoter Simon North and Ian Watson of the BARC have liaised closely with the category’s teams to come up with a workable solution to assist Formula Renault UK. The Renault GP Cup will be a replacement for the proposed ‘Formula Renault Junior’ class, which would have utilised the Tatuus FR 2.0 cars currently raced in the BARC series – albeit with a different engine restrictor. So as to avoid any issues with testing bans at particular venues for the Formula Renault BARC teams, the viable answer is for the Renault GP Cup to take place during the last three events of the Formula Renault UK season, which is expected to bring an additional 10 or 12 drivers onto the UK grid. Only competitors already registered for the Protyre Formula Renault BARC Championship will be eligible to enter their ‘BARC’ specification FR 2.0 cars in the UK championship races on 8th/9th September at Silverstone Grand Prix Circuit (supporting British Formula 3), on 22nd/23rd September at Rockingham and 20th/21st October at Brands Hatch (both supporting the British Touring Car Championship). 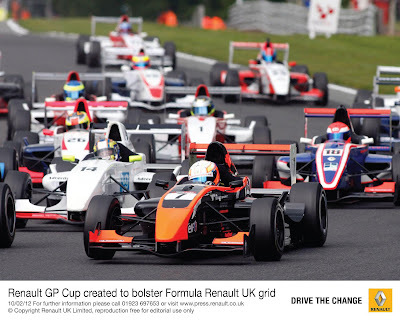 While the already announced main Protyre Formula Renault BARC Championship season will still be in progress when the Silverstone GP Circuit and Rockingham Formula Renault UK rounds take place, the Renault GP Cup is a standalone entity and will not form part of the main season title race. “We’ve been working very closely with the BARC and SRO, who have been in touch with the Formula Renault UK teams, to arrive at a solution to help improve their grids and the Renault GP Cup is the perfect answer”, said Protyre Formula Renault BARC promoter Simon North, “Drivers will only be able to enter the Cup by being registered for the BARC Championship, we envisage it could bring as many as 12 more drivers onto the UK grid. 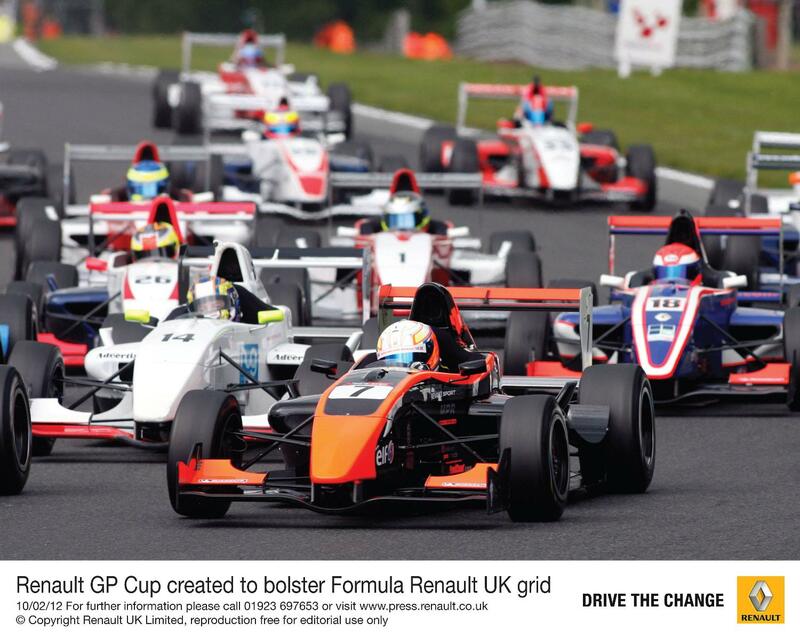 Teams from Protyre Formula Renault BARC have widely welcomed the creation by the BARC of the Renault GP Cup which will give drivers an extra opportunity to race on a bigger stage at three of the UK’s most popular venues – the latter two likely to feature television coverage on the ITV network. Jon Pettit, team principal of 2008 and 2009 Protyre Formula Renault BARC Champions Scorpio Motorsport, commented: “I like the idea of the Renault GP Cup, it gives us and our drivers a bigger stage to race on and it will also help to continue raising the profile of the BARC championship. “It got to the point where not enough people wanted the Junior class in Formula Renault UK”, added MGR Motorsport team principal Mark Godwin, “The Renault GP Cup is a great idea though, it all depends how popular it is with the drivers but I think we should get quite a few wanting to do it. The main Protyre Formula Renault BARC Championship season will commence on 7th/8th April at Snetterton in Norfolk and will conclude at Silverstone in Northamptonshire on 6th/7th October. Avon Tyres has introduced a quicker, more consistent tyre product for this year’s British GT Championship. The Avon brand, manufactured by Cooper Tire & Rubber Company Europe Ltd, has unveiled the fourth generation of its GT racing tyre since it took over as sole supplier and title sponsor of the series in 2006. Avon Tyres Motorsport technical manager, Mike Lynch, believes the new tyre will be around a second quicker than its predecessor around most circuits on the British GT calendar but, importantly, will also be durable enough for teams to use strategies demanding longer stints. The new tyre has been extensively developed over the last two years, with Avon Motorsport evolving its previous generation product in endurance series such as the VLN. 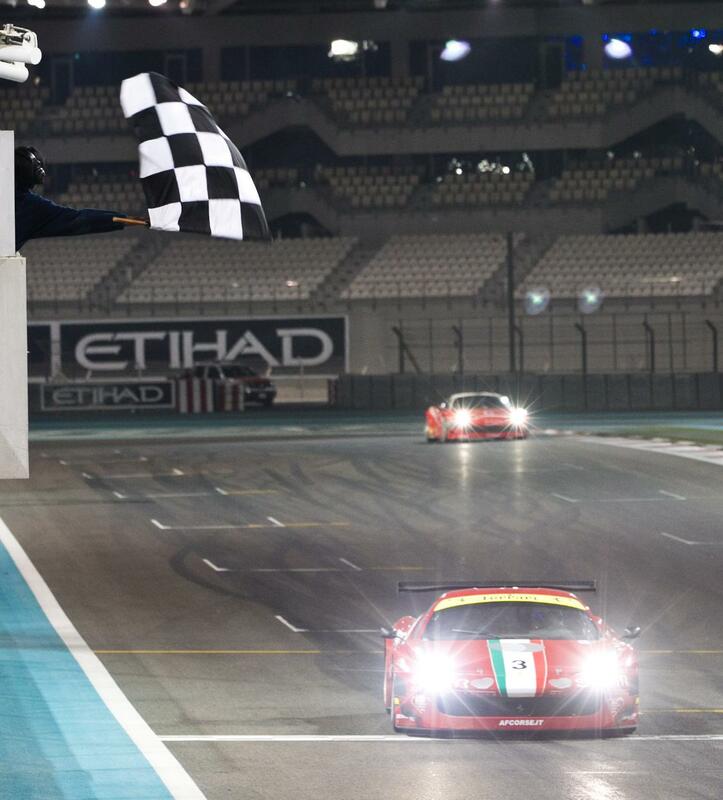 It was also used and well received by all teams at the inaugural Gulf 12 Hour in Abu Dhabi recently. Lynch said, “The new tyre has been developed using a wide range of cars so we can be sure that it will suit the range of cars we have in the British GT Championship. It is a more consistent, faster product and will provide a more stable drive so our drivers should feel more comfortable when pushing their sports cars to the limit. Avon has also prepared a new wet weather tyre for the 2012 season, which Lynch says will be considerably quicker and easier to drive than its predecessor. The British GT Championship is the UK’s most high-profile sportscar championship and features supercars such as the Ferrari 458, Porsche GT3, BMW Z4 and Lotus Evora GT4. The new tyres will be used by teams for the first time at the championship launch event in March. The championship kicks off at Oulton Park on April 7-9.